Re: Different Lovetts: Which One is the Best? Lansbury's Lovett is a psychopath, a master manipulator who is the true "supervillain" of the piece. She plays everyone and everything against each other for her own benefit. 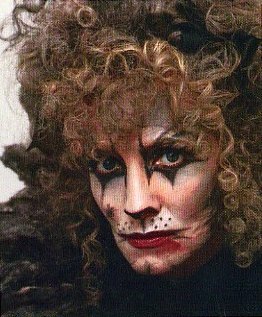 Carter's Lovett, and to a lesser extent LuPone's, is a sociopath, who is not so much deliberately manipulating those around her as deciding what she wants and letting nothing, ESPECIALLY morals, prevent her from getting it. Right! So, I had a chance to go away and enjoy the Original Broadway Cast (fantastic), and Lansbury. Let's face it, you're right, she's the best. I still like Carter though. Regarding Lovett loving Sweeney, in the musical I'd agree it's a more selfish action than the fundamentals of love. Like, her love (and attempts to get it on with him) were more for a selfish possession (totally agreeing with dolbinau). So to me it sounds as though when she dreams of living down by the sea it's more like a fascination, and when she sings "I lied because I love you" was sort of just a justification she assigned to it. Er messy, in summary she does love him, but it's more in treating him as a possession? You've all already confirmed this...I just thought I'd agree. My favourite Lovett HAS to be Lansbury. There's no way of describing it other than saying that for me, she's Mrs. Lovett. She's manipulative and batty, slightly bawdy and terrifyingly ammoral. I'm not a huge fan of Patti at all, though it's mostly due to her voice. I actually preferred her in the 2006 revival than I did in the concert and I found it fascinating to see the difference in portrayals between Patti and Angela, Patti's Lovett was definately more knowingly/overtly scheming and manipulative (Lansbury's Lovett always seemed innocent even though she wasn't while I think Patti's Lovett makes you question her motives earlier?) and I also liked that she seemed more sexual- particularily at the end of Worst Pies with the clevage exposure! I also liked that she wasn't as... well... PATTI in Sweeney. Random but this impression of someone singing as Patti in By The Sea made me laugh. I don't know if any of this makes sense because it's half 2 in the morning and I'm falling asleep. Well now, wait. It was my understanding that she had loved him since before his incarceration. So the question becomes why did she love him before? Or maybe I'm wrong. For what it's worth, that's what it says on the Wikipedia page (though we all know how credible that site is). Last edited by Cptn. Wazoo on Fri Jun 01, 2012 11:38 pm, edited 2 times in total. I've only seen one Lovett so I can't really have an opinion here but I do agree with some of your points. Angela Lansbury is without a doubt the best stage Lovett. No one can play it like her. Other great stage Lovetts that I have heard or seen are Julia McKenzie, Sheila Hancock, Beth Fowler and Imelda Staunton. I really liked Helena Bonham Carter in the film, it worked. Had she played the character like that on stage, then it would have been terrible. you arent suppossed to like Lovett in the end,you should hate her. Very funny, but very true.